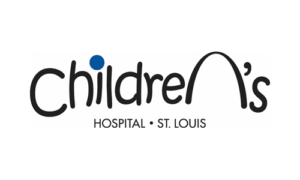 The neurorehabilitation unit at St. Louis Children’s Hospital has served children in the St. Louis metropolitan area and throughout the Midwest since 1991. The nine bed neurorehabilitation unit was created when neurosurgeons Dr. T.S. Park and Dr. Bruce Kaufmann spearheaded the effort to coordinate the team of providers caring for patients recovering from traumatic injury, illness, or surgery. At the time, the therapists were employees of several different organizations which made care fragmented and inefficient. Follow up care was extremely cumbersome for families to navigate. The doctors’ insistence that care be provided in a more effective manner led to the initiation of the Neurorehabilitation program under the direction of Dr. Michael Noetzel, pediatric neurologist and Medical Director of Clinical and Diagnostic Neuroscience Services, and Diedre Hartung, MS, CCC-SLP, Director of Therapy Services. Although much has changed since the program began, Dr. Noetzel remains the fearless physician leader of the program! For the past 16 years, the Neurorehabilitation program has hosted an annual celebration for the graduates of the program, their families, and the clinical rehab team. The Reunion is eagerly anticipated by children and families who look forward to seeing other graduates and the team who provided their care. However, it’s hard to imagine that the children and families could anticipate the event more than the staff! Visiting with former patients and celebrating the progress they’ve made since discharge is humbling, inspiring, and energizing – and makes it all worthwhile! The magical event is hosted at “The Magic House,” a local children’s museum. Each year 30-35 graduates return for the celebration – both recent patients and patients from the early years of the program attend. It is a special opportunity for the Unit staff to celebrate with individuals and families who may have feared that they would never again have a reason to celebrate – and what a celebration it is! The Neurorehab team finds great reward catching up with adults who were among the first patients on the unit – many now with children of their own! The more recent graduates play in the museum and show off new and refined skills during the party while their therapists and nurses admire and enjoy. 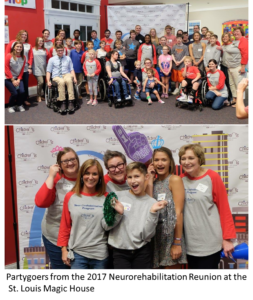 Though the evening always seems to end too quickly, the sadness at the end of the reunion is assuaged by immediate plans for the next year’s event – a celebration of new and old friendships forged during the course of neurorehabilitation at St. Louis Children’s Hospital!